There is so much confusion about the various baptisms mentioned in the New Testament. Many Christians think that every time they see the word “baptism” that water is involved. Did you know that there are eight or more “baptisms” mentioned in the New Testament? Did you know that not all of the baptisms noted in the Bible are for believers? Did you know that there are two (possibly four) baptisms that actually involved water, and only one of those should be practiced by Christians? 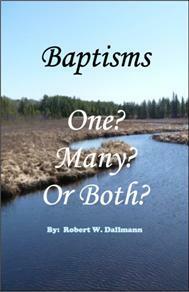 This book is an effort to help bring clarity to the various baptisms mentioned and taught in the Bible. If one does not understand which baptism they are speaking about, misunderstanding and erroneous interpretations are likely to follow. Christians who want to understand the whole subject of Baptism better. Preachers and teachers who may lead classes for baptism. A helpful study aid for private bible study.